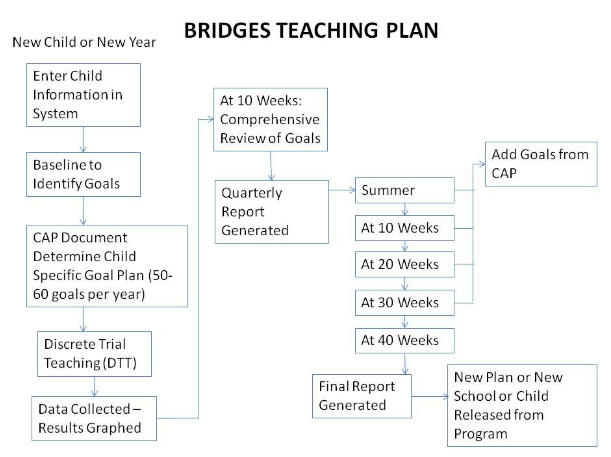 Bridges ABA was first implemented at Newmeadow in upstate New York in 1996. Its sister company, Educational Models Inc., has created excellent videos, a basic workbook of preselected goals, and software that is easy to navigate and use. All are reasonably priced and based on the science of ABA and nearly 2 decades of experience. These developments, videos, workbook, and software, and an operating preschool for special children assure an easily replicated ABA program for schools and agencies. To study the possibilities costs very little and risks nothing. Viewing the videos can happen immediately as well as subscribing to the software for one month for staff to try. Please peruse this website for all that a Bridges ABA program can offer you. If it establishes itself in your school, staff and parents will be thrilled. Children will change quickly. Newmeadow is available for a visit to see a Bridges ABA program in action and for training. If the distance is too great, Skype with us for a free discussion. Call 1-888-222-8273. We’ll set it up. Hard copy of Child Achievement Plan (CAP) and Graphs can be generated at any time. Quarterly Reports are generated: Summer, November, January, April and June. Goals can be added, changed or removed at any time.